At ADA Engineering, we can start from a hand sketch either presented by the customer or developed on our own based on customer's ideas, followed by a thorough review of design objectives and statistical data, if any. The range of airworthiness regulations we usually use in our design process includes FAR Part 103, German LTF-UL requirements for ultralights, LSA rules, Experimental Category, FAR Part 23, EASA CS-23 and CS-VLA, military specs. As soon as client's thoughts are translated into design specifications and preliminary design criteria are met, we start working on a three-dimensional parametric computer model using a CAD software. Specifically, this is when lofting - outer surface of the aircraft / outer mold line (OML) - is developed, considering overall layout/arrangement. 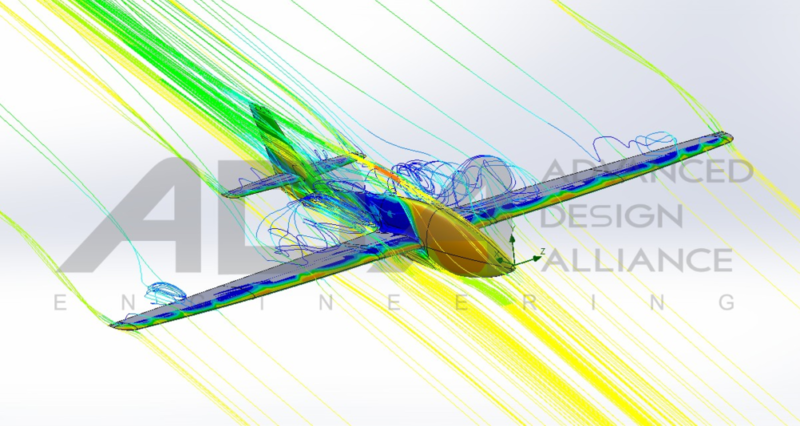 Aerodynamic analysis, with use of computational fluid dynamics (CFD) techniques, helps to see into flow behavior, aerodynamic forces, pressure distribution, and shape optimization for flight modes of interest. Once approved at this stage, the project turns to its next phase - detail design.